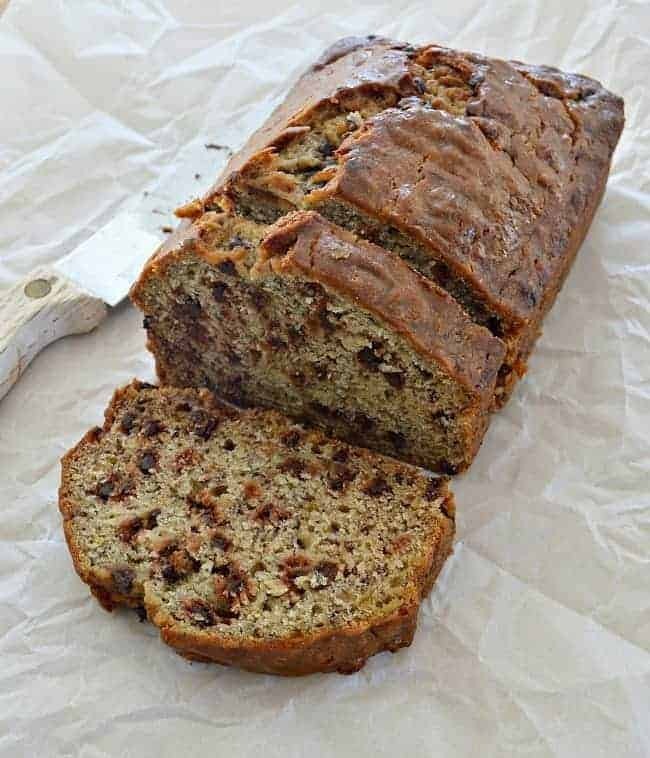 An easy banana bread recipe with a sweet secret ingredient! Do you have a go-to dessert you like to make when you have an event or just want something yummy? 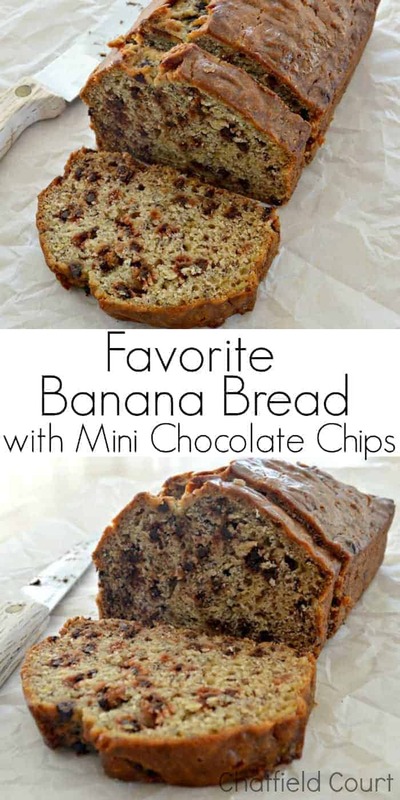 For me it’s an easy to make banana bread with mini chocolate chips recipe. It’s one of my family’s favorite snacks. 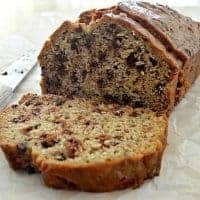 This banana bread is seriously so easy to make, involves no heavy machinery and you only need to use one bowl. 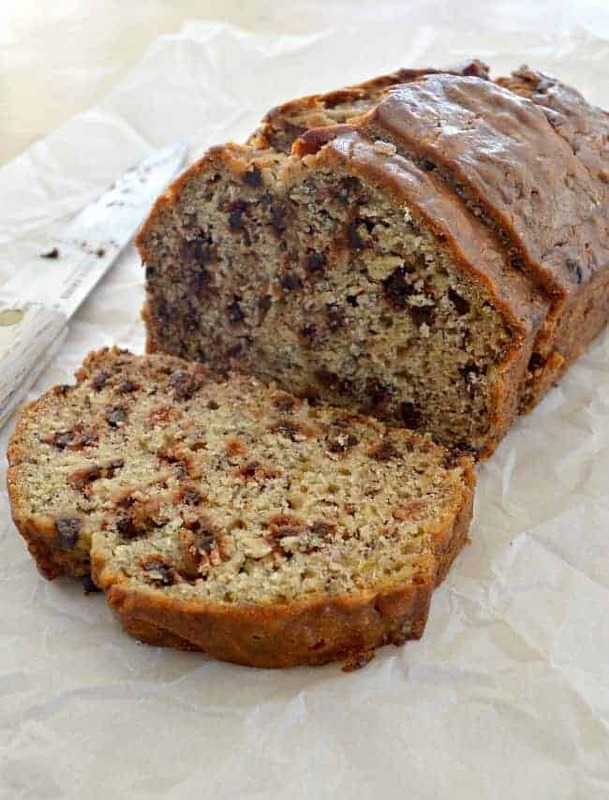 Try this easy banana bread with chocolate chips recipe. So moist with lots of chocolatey goodness. Preheat oven to 350° (175° C). Grease a 9x5 inch loaf pan. In a large mixing bowl mash bananas with a fork (I use my clean hands) until smooth. Add softened butter to mashed bananas and mix well. Add the baking soda and salt to the banana mixture. Next add the sugar, egg and vanilla. Add in the flour and mix well. Stir in the mini chocolate chips. Pour batter in your greased loaf pan. Bake for 1 hour to 1 hour 10 minutes at 350°, 175° C, until toothpick inserted in the center of the loaf comes out clean. Remove from loaf pan and cool completely. I’m not a sweet eater but I can’t pass this up. It’s the perfect snack to have with my nighttime cup of tea. 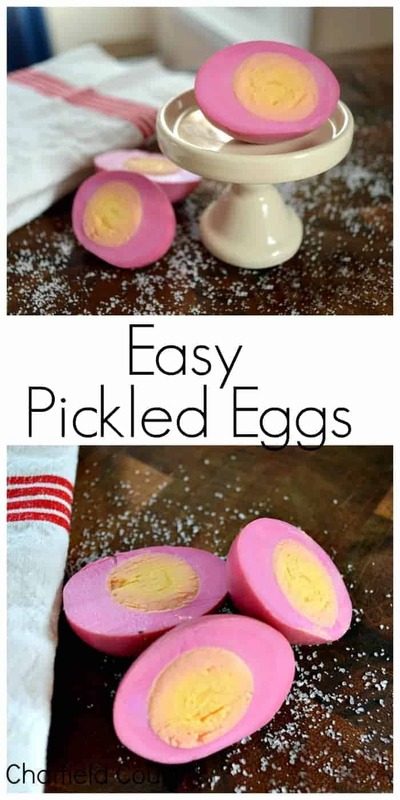 Have you checked out my recipe for pickled eggs? It’s a must try…really. Yum…sounds so good and something I would want to use. Thanks for sharing with the Thursday Blog Hop! Thank you Pam! I appreciate you all hosting your Blog Hop every Thursday. Thanks so much Katherine! Always love your party. That looks really good. I have a similar muffin recipe, but not a bread one. It looks really good. I’m here from the Thursday Favorite Things Blog Hop. Hi Brenda. Thanks so much for visiting from Thursday Favorite Things Blog Hop. You’re right Mila. Nothing beats a banana bread/chocolate chip combo. Thanks for the invite to your new linky. I will be sure to visit. I love banana bread but have never tried it before with chocolate chips. This is a recipe that peaks my interest! I think I will give it a try. I like that it’s easy too. I’m always looking for something to do with my over ripe bananas. Thanks for linking up to Share Your Style tonight too! My family won’t eat my banana bread unless it has chips in it, mini chips to be exact. 😉 It’s a great and easy recipe to make with over ripe bananas. Thanks to you and all your co-hosts for having such a great party! Wow, busy lady! But look, still time for baking with all that painting your doing! your a superwoman dear! I love banana bread but never tried it with chocolate chips?!!! I should! Thanks for sharing! Thanks so much for stopping in Vel. When a banana bread craving hits Debbie, nothing will stop me from baking it. 😉 I’m just glad that I still have a working oven to use. Thanks for visiting today! Happy weekend.